A 2019 Sydney Taylor Book Award Winner! It's been five years since the Sweep disappeared. Orphaned and alone, Nan Sparrow had no other choice but to work for a ruthless chimney sweep named Wilkie Crudd. She spends her days sweeping out chimneys. The job is dangerous and thankless, but with her wits and will, Nan has managed to beat the deadly odds time and time again. When Nan gets stuck in a chimney fire, she fears the end has come. Instead, she wakes to find herself unharmed in an abandoned attic. And she is not alone. Huddled in the corner is a mysterious creature—a golem—made from soot and ash. 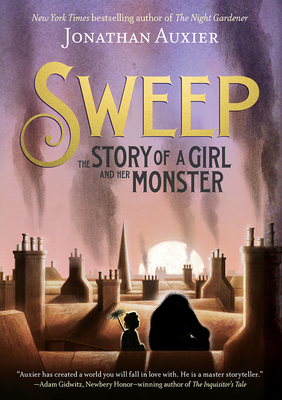 Sweep is the story of a girl and her monster. Together, these two outcasts carve out a new life—saving each other in the process. Lyrically told by one of today's most powerful storytellers, Sweep is a heartrending adventure about the everlasting gifts of friendship and wonder. "Auxier wipes away the grime from a bleak chapter in history, where children were forced to work dangerous jobs that claimed many lives. He questions what makes one a monster and applauds helping others, activism, education, earthly marvels, and the possibility of magic. Nan’s fiery personality will attract readers like moths, and Auxier's unusual blend of mythology and history will keep them transfixed." "This dazzling, warmhearted novel contemplates selflessness and saving, deep love and what makes a monster." "Auxier (The Night Gardener, 2014, etc.) turns his imaginative whimsy and lyrical prose to a real historical horror; while never gratuitous, he does not shy away from the appalling conditions under which children labor, nor does he ignore the sacrifices and struggle to abolish the practice. The inclusion of two (possibly three) Jewish characters suggests the intertwining of anti-Semitism and class exploitation, while references to such authors as William Blake, Daniel Defoe, and Mary Shelley demonstrate how literature could fire imaginations and highlight oppression." "The novel doesn’t inch from the difficulties of life for poor and orphaned children in nineteenth-century London, but its dominant tone is one of warmth . . . This bittersweet coming-of-age tale will leave readers with the notion that even young people can make a difference when they raise their voices about issues they care about." "Weaving together strands of Jewish folklore (Nan calls Charlie a “soot golem”), Blake’s Songs of Innocence and Songs of Experience, Shelley’s Frankenstein, the history of child-labor reform, and his own threads of magical realism, Auxier crafts a beautiful, hopeful story out of some ugly realities of nineteenth-century British life." "Jonathan Auxier weaves a magical spell that draws readers right into the stark, gritty streets of Victorian London . . . Readers will be entranced." "A stunning historical fantasy novel about the power of friendship, our potential for courage, and the beauty of remembering loved ones . . . Excellent writing and skillful integration of historical fact with compelling characters make this a must-buy."